Education and Educational Research: Society, Schools, and Progress in Tanzania focuses on the educational system in Tanzania. The book first offers information on the economy, territorial domain, form of government, and progress of education in Tanzania. The text also outlines the road to independence of this country. The rise of the African people to political power and the introduction to international relations are underscored. The text also examines the policies and administration of the Tanzanian government from 1945 to 1961. The selection also traces the development of education in Tanzania in two periods: 1945 to 1956 and 1957 until 1961. The institution of educational programs, reforms, and legislation during these periods, as well as the development of education outside the school system, are underlined. 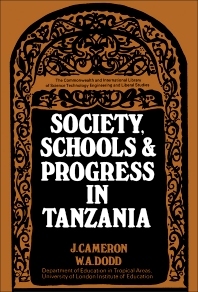 The text also examines the policies and administration of the Tanzanian government from 1961 to 1966, and also the progress in education during this period. The educational reforms, programs, and legislation instituted during 1961 to 1966 are then discussed. The book is a vital source of data for readers interested in the development of education in Tanzania.